After making Cha Ca Thang Long (Vietnamese Hanoi-Style Turmeric Fish with Dill) with that big hunk of sturgeon that my oldest aunt gave me, I ventured to the opposite end of Vietnam for a recipe for the other half of the fish. I had just finished preparing the fish and had marinated it for cha ca Thang Long when youngest aunt called me to come over for Hu Tieu Saigon (Vietnamese Clear Noodle Soup with Barbecued Pork and Shrimp). I wasn't about to pass up hu tieu, plus it gave me the chance to ask my uncle how to make Bun Nuoc Leo Soc Trang (Vietnamese Rice Vermicelli Noodle Soup in Savory Broth with Fish, Roast Pork, and Shrimp). Youngest aunt's husband is from Soc Trang, in the Mekong Delta, so he would know. What makes the nuoc leo (Vietnamese broth) distinct in this dish is the use of mam ca sac con (Vietnamese gourami fish sauce). No, other fish won't do, uncle says because the taste just wouldn't be right. But I guess if you can't find this particular type of fish sauce, then make fish broth instead. Galangal and lemongrass also add nuance to the broth and help cut some of the fishiness. 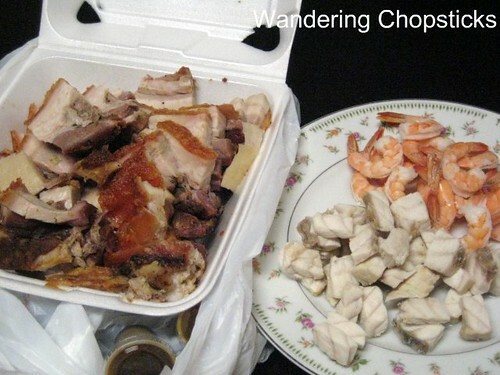 Also, the proper way to serve the pork in this soup is to use roast pork, not boiled. 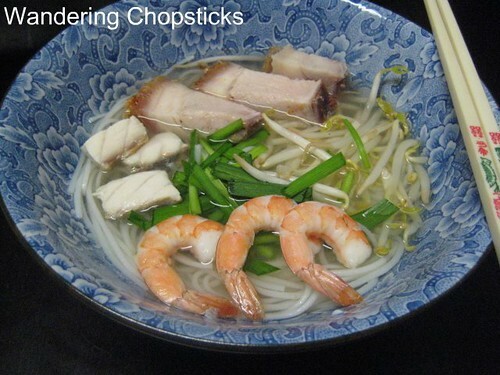 Then it's just a matter of adding shrimp, rice vermicelli noodles, flat-leaf chives, bean sprouts, and other herbs. Look for a jar of mam ca sac con in the fish sauce aisle of your local Asian grocery store. If you can't find this particular kind of fish, then you're out of luck. Bwahaha! Well, you could try substituting with fish bones and regular Nuoc Mam (Vietnamese Fish Sauce) or possibly Mam Nem (Vietnamese Fermented Anchovy Sauce), but it won't be the same. And yes, it will be stinky! 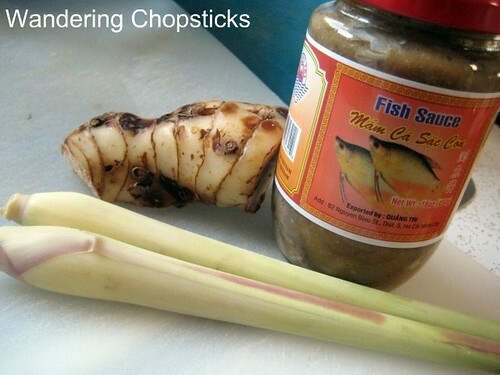 You'll also need a big knob of galangal and a few stalks of lemongrass. Peel and slice the galangal. Whack it with your knife or a pestle to bruise it a bit. Whack the lemongrass too in order to release the fragrance. 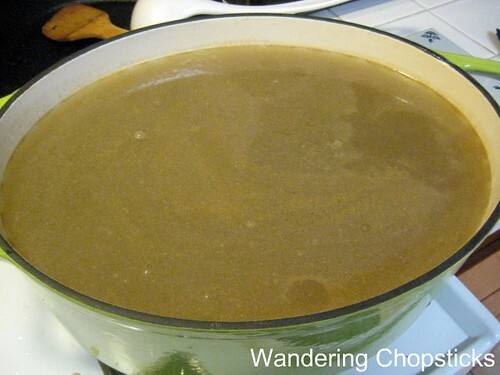 Fill a 5-quart pot with 4-quarts of water and add the fish sauce, galangal, and lemongrass. Let the broth simmer on medium for about an hour. Meanwhile, peel and devein the shrimp. Toss the cleaned shrimp shells into the broth too while you're at it. 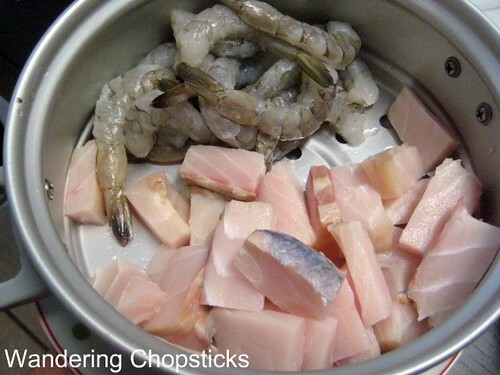 Clean and cut the fish into bite-sized pieces. Put the meat in the fridge until needed. 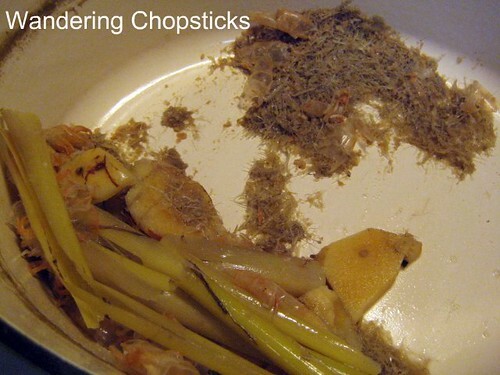 After cooking for an hour, the fish will have completely dissolved. 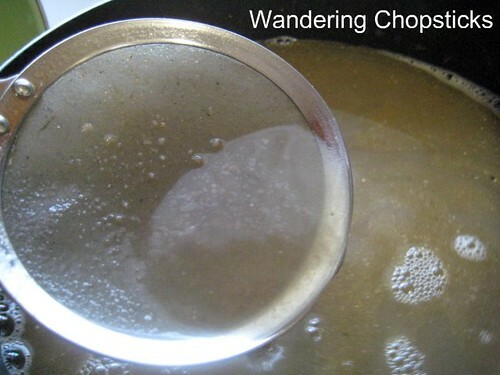 Strain out the broth by ladling/pouring it over a colander or sieve. See? Just tiny bones of the fish are left. I strained it a bit more with my skimmer spoon. The broth will still be rather murky. I let it cool down and the fish and impurities will settle at the bottom. See? 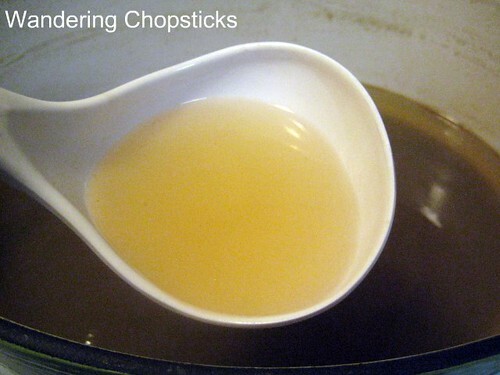 Clear and flavorful broth. Ladle out the top clear layer into another pot and leave the sediments at the bottom. 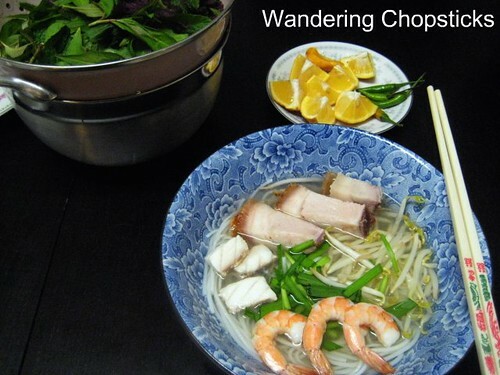 You can add the shrimp or fish into the broth to cook, or boil them separately. It's up to you. Store-bought roast pork because it's too laborious to make my own. 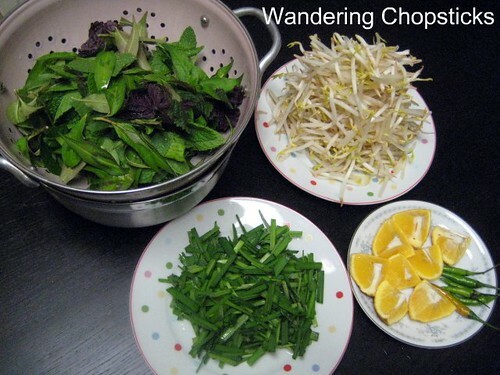 Prepare your herb platter, bean sprouts, chives, and lemon wedges. Boil the rice vermicelli noodles. Turn the heat to high on the pot of broth so it gets boiling. 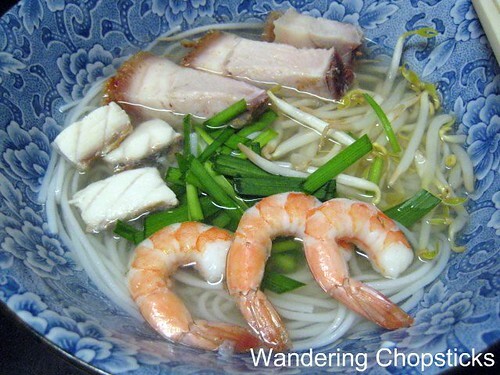 Serve by adding noodles into each bowl, appropriate amounts of fish, pork, and shrimp, and ladling the broth over it all. Let each person garnish as they wish. 1 year ago today, com lam (Vietnamese sticky rice in bamboo) in Sa Pa - Vietnam. 2 years ago today, French food and a rather odd encounter at Brasserie Astuce Restaurant - Pomona (Closed). Wow, that sounds and looks really delicious. Definitely a dish that both Parker and I will enjoy. I bet my dad will like this, too. I don't think I've ever seen sturgeon on sale here...any tips on other fish that will hold up well in and be the right flavor for this soup? I think catfish or any other white fish should be fine. Boil them separately and add them in at the end so they won't fall apart. The key is really finding the sa dec fish for the proper broth.